Diary of a bereaved mother, 丧儿记,: 丧失儿子的母亲的一本传记: Nature playing a trick. 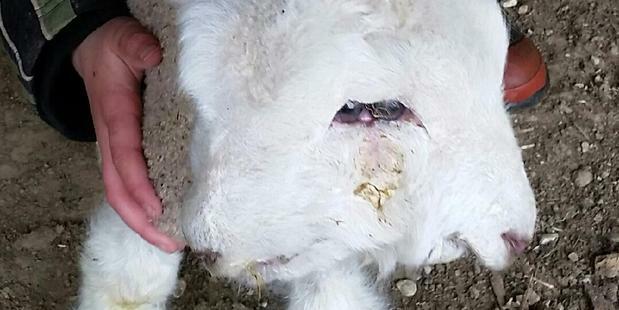 The little lamb born with two faces in Southland has died after living far longer than was expected. The lamb known as Lambie, Two Face and U2 lived for 41 days at the Slope Point Backpackers accommodation in Invercargill, his owner Justine Parker said. She found him yesterday morning and suspected he had died from a brain bleed. "There was some blood behind his eye...he had no signs of an infection," Ms Parker said. "We knew he was probably going to die, but he'd come through so many things and kept bouncing back. "He was a strong willed wee character, so it was just a wee bit sad." Lambie's body is being kept in the freezer in case it could be used for research, she said. "It would be a shame just to throw him down a hole - someone might benefit from it." Ms Parker's three daughters Anna, 10, Sarah, 8, and Kate, 6, would play with the lamb. "They were realistic that he wasn't meant to be, but we thought he may have got through the worst of it because he'd been tailed and he was feeding off the lamb feeder." They were "pretty lucky" to be involved with such a special lamb, Ms Parker said. Lambie had double of everything - four eyes, two of which appeared to have merged in the middle and did not blink. When his left eye blinked, so did the right. When he cried, the other mouth opened too. After the lamb's birth, Ms Parker told the Herald: "The lamb actually fell in the creek. I rescued it and went to put it back with its mother. "I thought, 'Oh, the back of his head looks a bit strange'. And I turned it round and wow. I just thought, 'Heck, what's this'?" The lamb had four eyes, two of which appeared to have merged in the middle and did not blink. "It's almost like he's got a mirror down the middle," she said. The family had heard of other lambs being born with a similar deformity at nearby farms, but none had survived longer than a day. Ms Parker had told the Herald her three young daughters - Anna, 10, and Sarah, 8, Parker and Kate Wilson, 6 - were smitten with the lamb and loved to feed and cuddle him. She had said in September: "He interacts with the other lambs and he wags his tail and talks to you. "The kids and I know that he's not going to live for long...but we're giving him a chance just like any other lamb." I have a new friend, she comes from Nepal. I told her about the Siamese Nepalese twins I was involved in helping to separate. Nature sometimes play a joke. I remember mother's ducklings. There were times they were hatched with double beaks. They usually did not survive.